It is generally accepted that geese, which are of the Family Anatidae and the Genus Anser, were one of the first animals to be domesticated. Their domestication probably took place in Egypt about 3 000 years ago, although some research suggests that it may have been even earlier. 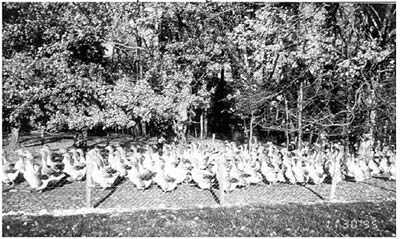 Despite this, geese have never been exploited commercially as much as chickens or even ducks have been. Geese are found worldwide. They can adapt equally well to hot climates (as long as shade is provided) as to cold climates - as seen in their ability to withstand northern winters out of doors with the minimum of shelter. In spite of this broad adaptability, commercial goose production is only important in relatively few countries in Asia and Europe. Domestic geese come in a wide range of colours, sizes and shapes. In general, domestic breeds are much larger than their wild ancestors although they have in many cases retained their ability to fly. There are two main types of domestic geese. The first are thought to have their origins in Europe, descendants of the wild Greylag goose (Anser anser) and the second are thought to have their origins in Asia, descendants of the wild Swan goose (Anser cygnoides). Crosses between the domestic breeds which have originated from these two species of wild geese are fertile and in fact have resulted in a number of recognised breeds. 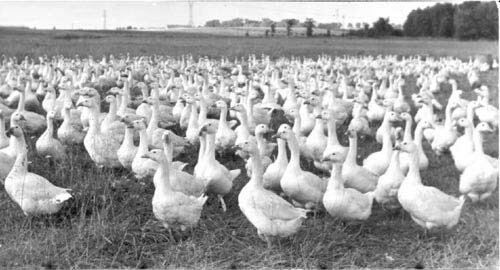 Over the centuries many countries, and even regions within countries, have developed their own breeds and types of geese. But although there is a large pool of genetic material available for the genetic improvement of the domestic goose, it appears to have been relatively under-utilised. In addition, there are also species of wild geese which could be domesticated or could at least contribute to the commercial goose germplasm. For example, from temperate climates, there is the Canada goose (Branta canadansis) of North America and the American Swan goose (Coscoroba coscoroba) of southern South America. From the tropics, there is the Egyptian goose (Alopochen aegyptiacus) from Africa, the Nene goose (Branta sandvicensis) from the Hawaiian Islands, the Bar-headed goose (Anser Indicus) from India and central Asia, the Northern Spur-winged goose (Plectropectus gambensis) from Africa and the Semipalmated (magpie) goose (Anseranas semipalmata) from Australia and New Guinea. This book will deal only with domestic geese that descended from either the Greylag goose (Anser anser) or the Swan goose (Anser cygnoides). From the research for this book and a search of its Animal Genetic Resources Data-base, The Food and Agriculture Organization of the United Nations (FAO) have identified 96 breeds or genetic groups of geese, although there are probably more. Many of these breeds, although important world germplasm resources, are of little direct economic importance today because of their relatively low performance level and/or their low numbers and limited geographic distribution. In addition to these breeds, both old and new, there are a number of commercial cross-breeds made available by companies specialising in goose breeding. In this section on breeds of geese, detailed information is provided on a number of representative breeds from around the world. In Appendix I all the breeds which FAO has been able to identify are listed, along with their performance characteristics. There are over 20 breeds of Anser cygnoides geese in China. The breed described here is the one commonly known throughout Europe and North America as the Chinese goose and readily identified by the knob at the base of its beak (Figure 3). There are white and brown varieties but the white variety is by far the more popular. The declining popularity of the brown variety is probably due to the fact that when the birds are killed, the coloured pin-feathers produce a less attractive carcass than the white feathered variety. The white Chinese geese have orange shanks, beaks and knobs while the brown variety has orange shanks but its beaks and knobs are black or very dark green. One feature of the knob is that it can be used for sexing at 6-8 weeks of age, if not before. The knob of the male is larger and more pronounced than that of the female. The Chinese goose is relatively small in body size with mature males averaging 5.0 kg and females 4.0 kg. However, the breed is known for its high egg production and there are reports of Chinese geese laying up to 100 eggs in a breeding season of approximately five months (February to the end of June) although 50-60 eggs is the average. Egg weight, at 120 g, is lighter than for most other breeds. Because the body conformation and meat yield of the Chinese goose is not as good as that of other breeds, it has not been widely used for meat production, either as a pure breed or in breeding programmes as a female line to produce a crossbred commercial goose. 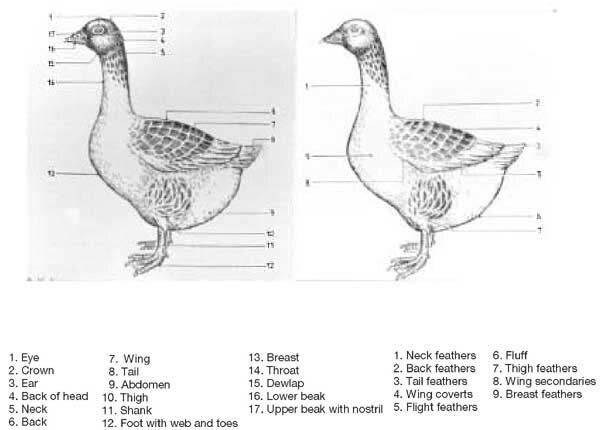 However, a number of breeds of geese have been developed by combining Anser anser type with Anser cygnoides type, using the Chinese goose as described here. The Chinese goose is reported to be very effective as a guard animal. In addition it has strong legs and when required, can range over large distances to forage. This may explain in part why the distribution of this bird extends beyond the borders of China and why they are commonly found in countries like Siberia and India. This goose is a white goose with orange shanks and an orange beak. It is also known as the Bohemian goose. It has a relatively small body size, with the males weighing 5.0 kg and the females 4.0 kg but its egg production, averaging 45 eggs with an egg weight of 140 g, is fairly good for Anser anser type geese. This means it can be useful as a female line in the production of a crossbred commercial goose. The Embden is a white goose with relatively tight feathering, an erect stand, orange shanks and an orange beak. Most strains of Embden can be sexed on the down colour of the goslings, as males are a lighter grey than females. This difference is evident until the goslings are two to three weeks of age. The breed has been relatively popular for many years in both Europe and North America. It is one of the larger breeds with males weighing up to 10.0 kg and females up to 9.0 kg. It has a moderate egg production producing 40 eggs per year with an egg size of 170 g. The Embden is suitable for heavy type meat production but is probably of more value when used as a male line in the production of a crossbred commercial goose. The Huoyan breed of geese originates from Changtu country in Liaoning province of China. It differs from the Chinese goose described previously in that it has a lighter body weight, and a very high rate of lay (Huoyan geese can lay more than 200 eggs per year). Huoyan geese have orange shanks and orange beaks, but there is considerable variation in feather colour. 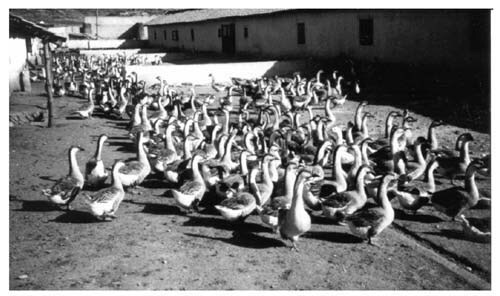 In 1981 the Animal and Veterinary Research Institute of Tie Ling in China obtained 500 Huoyan geese and began a genetic selection programme focusing on egg production. In addition to selecting for egg production, birds which were not white and which did not have openings in their eyelids were culled. The results presented here gives performance data for these Huoyan goose after four generations of selection. These selected Huoyan geese begin to lay at approximately 240 days of age and produce between 90-210 eggs per laying period with 10 percent of the geese producing 210 eggs per laying period. Egg weight ranges from 120-210 g. The adult body weight of the males ranges from 4.0-4.5 kg and that of the females from 3.0-3.5 kg. The Huoyan goose is noted for its ability to make good use of rough fodder and for its resistance to cold. 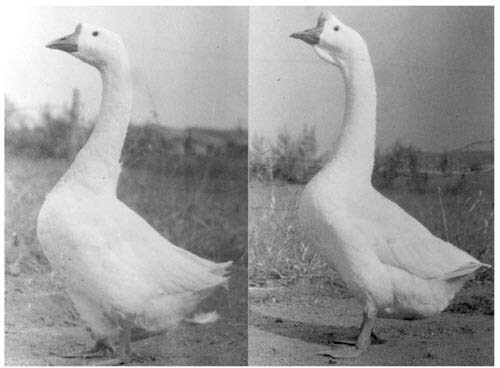 This breed was developed at the Kuban Agricultural Institute (southern Russia) by crossing Gorki and Chinese geese. The feather colour is brown which results in relatively dark pin-feathers and thus an unattractive carcass. These birds have orange shanks while their beaks and knobs are black to dark green. The adult body weight for the male is 5.2 kg and 4.8 kg for the female. The advantage of this breed is that they have a relatively high egg production of between 50-60 eggs with an average egg weight of 150 g. This makes the Kuban suitable for use as a female line in a crossbreeding programme provided it is used in such a way that the resulting commercial crossbreeds are essentially white and that the poor body conformation associated with the Kuban can be overcome. Both the males and females of this breed are grey and their shanks and beaks are orange to yellow. This breed originated in France but has been widely used in a number of other countries, notably Hungary, for the production of fatty livers (Foie Gras). Today there are a number of lines of the Landes that have been selected for their ability to produce fatty livers. They originate from the grey Toulouse geese, but today their feather phenotype is similar to the wild Greylag goose although they are much larger in body size. The adult body weight of the male is 6.0 kg while that of the female is 5.0 kg. 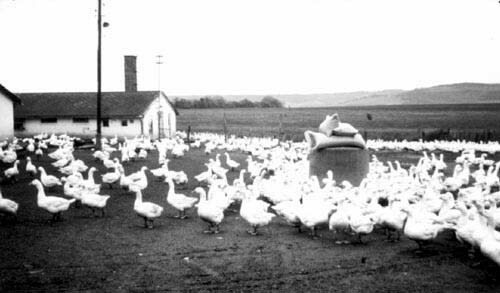 The annual egg production is 40 eggs per female per year with an egg weight of 170 g.
The Pilgrim is a breed of geese which was popular in North America and was recognised as a breed in 1939 but its popularity is declining. A unique feature of the Pilgrim goose is the sexual dimorphism of its adult plumage colour with the males being white and the females grey. The Pilgrim is a medium weight goose with males weighing 6.0 kg and females 5.2 kg. The annual egg production is 30 eggs per female with an average egg weight of 165 g.
Pomeranian geese originated from the north-western part of Poland but they are also present in north-eastern Germany and the south of Sweden. They come in three colours: white, grey or white and grey. In all cases, they have orange shanks and beaks. The Pomeranian as been described as a solidly built goose with the adult body weight of the male being 6.0 kg and that of the female being 5.0 kg. The average egg production is 40 eggs per female with an average weight of 170 g.
The Synthetic Ukrainian is an example of a relatively new synthetic line that has been developed at the Ukrainian Poultry Research Station, Borki, Ukraine. It is autosexing at eight weeks of age because the females have grey primaries while the males are white. It is a medium sized breed with the males weighing 6.0 kg and the females 5.4 kg. It has fairly good egg production with females averaging between 47 and 53 eggs per year. As the name denotes, the plumage of this breed is white and it has orange shanks and beaks. The physical characteristics of this goose are very close to the White Italian, but its body weight and egg production is lower. An improved line of this breed has been selected for feather production. It can also be used in crosses both for the production of fatty liver (Foie Gras) and meat. The males weigh 5.5 kg and the females 4.7 kg. The level of egg production is fairly good at 48 eggs per female with an average egg weight of 160 g.
The White Italian is a very popular breed in Europe and one often finds reference to it in the formation of local stocks. It is also a breed that has been well researched. The White Italians reported on in this publication are those kept at the Koluda Wielka Experimental Station in Poland where they have been under genetic selection since the 1960s and where separate male and female lines have been developed. 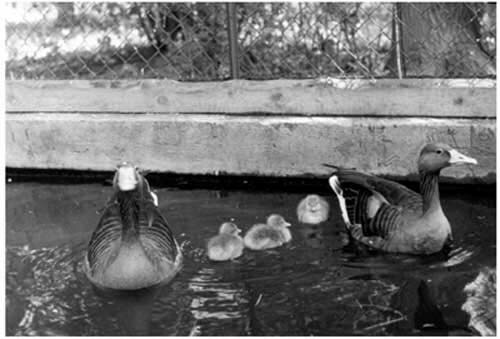 Goslings of both lines can be sexed during the first ten days of life on down colour, as males are lighter in colour than females. As the name indicates, the adult plumage is white while the shanks and beaks are orange. In the male line, the average body weight of males is 7.0 kg and of females is 6.5 kg, while in the female line the average is 6.5 kg for the males and 6.2 kg for the females. Annual egg production for the male line is 55-65 eggs while for the female line it is 60-70 eggs and egg weight for both is 160-180 g. The White Italian, at least for these strains, has the highest egg production of any of the Anser anser type breeds. Thus these lines can be used directly as male and female lines respectively to produce two-way commercial crosses or the female line can be used to produce a crossbred female parent line. The White Italian and particularly these lines, is therefore one of the breeds of choice for anyone wanting to produce geese for meat production.